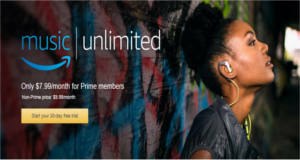 Enjoy a FREE 30-day trial of Amazon Music Unlimited– where you can get on-demand, ad-free streaming from a catalog of tens of millions of songs with unlimited skips on ALL of your devices! Download for offline listening. NOTE: You don’t have to be a Prime member to sign up for the free trial.